Radiant Dental Care - Service Provider of full mouth rehabilation, gum treatment & wisdom teeth removal in Chennai, Tamil Nadu. Full mouth rehabilitation is a highly customized treatment. The point of a full mouth reconstruction plan is to improve the health of the entire mouth,including the teeth, the gums, and the bite. In many cases, it is necessary to replace or restore every tooth in the mouth using a combination of dental treatment. Gums are the soft tissues that cover the roots of teeth and bone in which the tooth is embedded. Also, the gums provide nutrition and support to the bone. Gum problem generally starts with simple swelling, bleeding while brushing, sensitivity, pain and ultimately leading to tooth loss. Various forms of gum disease are present, out of which the commonest form is called ‘Gingivitis’. 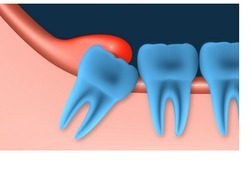 This occurs due to deposition of sticky foods (plaque) that later calcify and form calculs. The untreatesgingivitis turns into advance ‘Periodontitis’ causing tooth loss. Sometimes there is not necessary to remove a wisdom tooth if it is not impacted or causing any problem, but it also doesn’t provide any benefit rather blocking the growth of the healthy teeth. Through an X-ray report, dentists can figure out if there will be any complication in future or not. Sometimes wisdom teeth don’t break into the gum and erupt adequately, leading to entrapment of food particle that later results in dental complications. Some of the complications associated with wisdom tooth are tooth decay, gum diseases such as gingivitis, periodontal diseases, pericoronitis, cellulitis, formation of abscess followed by cysts and benign growths.